The dog days of summer have arrived! As millions of people head to beaches to beat the heat, it is important to remember that the ocean is a dynamic environment that can pose a number of hazards for swimmers. Chief among these are rip currents. Rip currents are strong, localized channels of water that move away from the shoreline. They can form on any beach with breaking waves and easily pull swimmers out to sea in a matter of seconds. According to the U.S. Lifesaving Association, rip currents are responsible for 80% of all surf zone rescues. Nationally, they cause more than one hundred deaths every year. 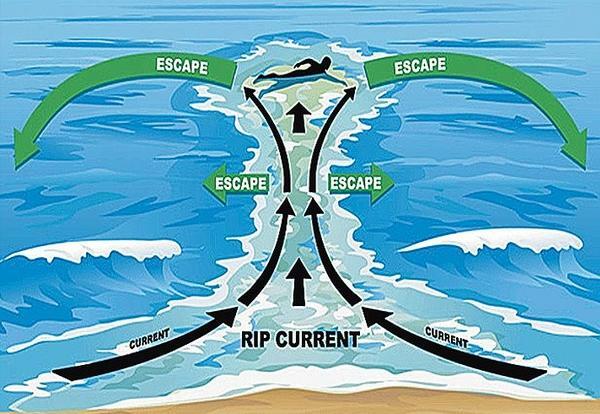 While rip currents are a serious hazard for all beach goers, they are a natural part of the near-shore ocean circulation. They develop when wind driven waves break strongly in one area and weakly in another, creating a circulation cell as the water looks for a way back out to sea. This usually happens at a break in an underwater sandbar or along a jetty or pier. Extending seaward for hundreds of yards, rip currents typically travel at one to two feet per second. However, they strengthen when onshore wind speeds pick up and wave height and frequency increase. If caught in a rip current, do not try to swim against it. Instead, swim parallel to the shoreline until you are out of the current and then make your way back to the beach. This entry was posted in weather and tagged health, ocean, safety, summer, wind, WRN by Melissa Fleming. Bookmark the permalink.